I quite like this pattern I have gotten into of football and chocolate desserts on Sunday afternoons. But of course leave it to me to get into football just as the season is coming to a close. Though I suppose my pattern does have more to do with the chocolate than the game. I enjoyed this past weekend’s game to the tune of some candy bar brownies. I decided to try out Alice Medrich’s well-known cocoa brownie recipe. I will admit I was skeptical. I like brownies dense and chocolatey. 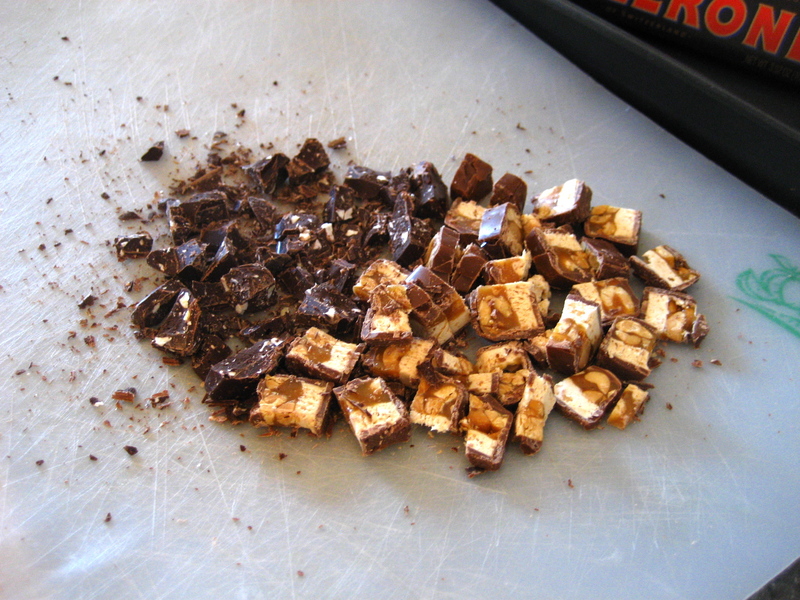 I like being able to taste the chopped and melted chocolate that went into them. The recipe is very quick and easy. I did make the change noted in this adaptation that calls for melting the butter and then adding the sugar and cocoa, as opposed to Medrich’s instructions which indicate to melt all three together. 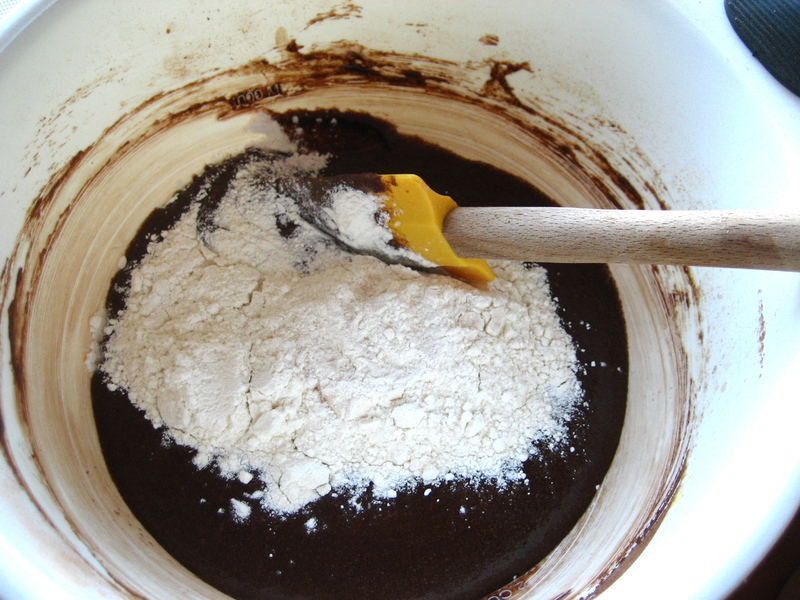 After you add the flour, the mixture comes together into a silky and smooth batter. Snickers and dark chocolate Toblerone just happened to be what was on hand, but it ended up being an excellent combination and I highly recommend it. I am probably the most impatient person in the world. Actually. But, I really must say these brownies are infinitely better when cooled. That is not to say I didn’t eat three of them minutes after they emerged from the oven. But when they were hot, I could not detect the Toblerone at all, and the Snickers dissolved into runny clumps of caramel and peanuts. The brownie itself was also loose and fell apart easily (unsurprising for a baked good that just came out of the oven). 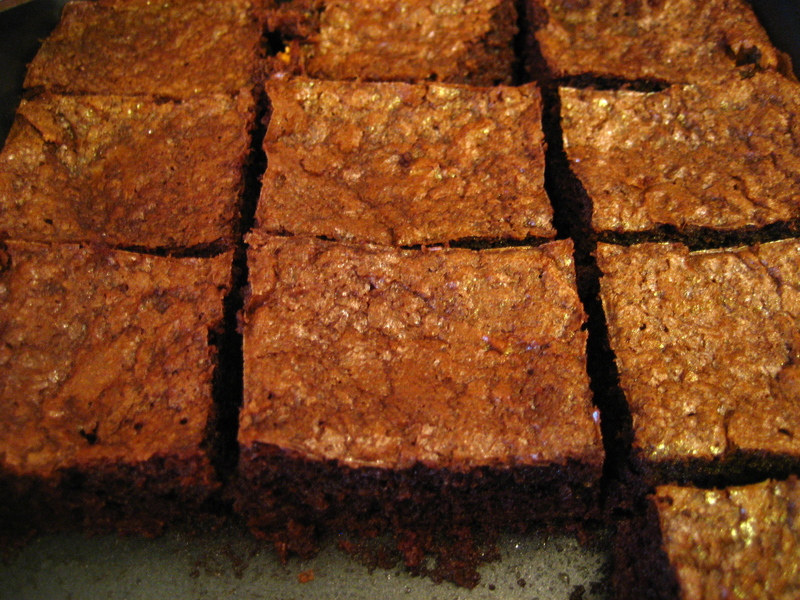 The next day, the brownies set up into a slightly dense and fudgey bar, but still with a certain lightness to them. You could taste the Toblerone, which had solidified ever so slightly. The milk chocolate around the Snickers had mostly dissolved, but the caramel and nougat also cooled into soft chewy nuggets throughout the brownies. This is not the most intensely fudgey and dense brownie, which is sometimes just what you are looking for. It is the perfect as a game day treat. Whatever the game happens to be. 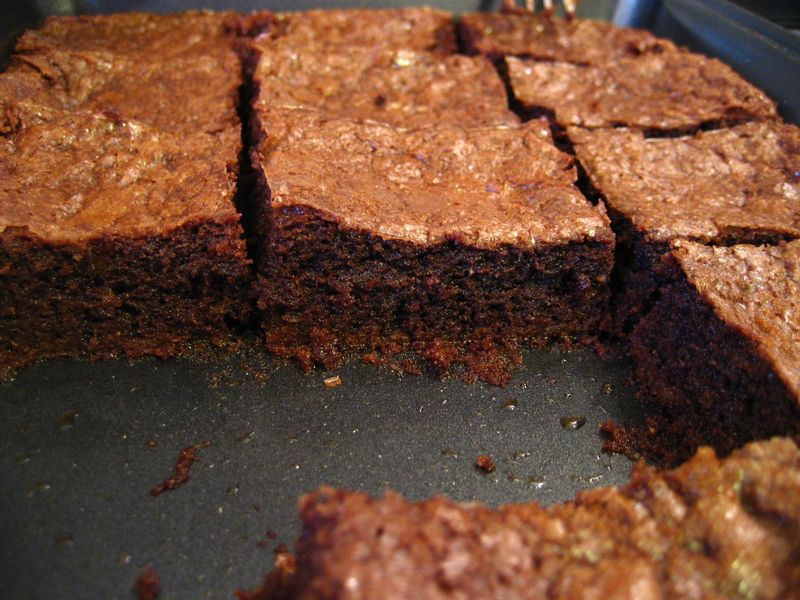 Since people keep chiming in with great suggestions, I’ll go ahead and ask, what candy would you put in a brownie? 1. Preheat the oven to 325°F. Line the bottom and sides of the baking pan with parchment paper or foil, leaving an overhang on two opposite sides. 2. Microwave butter until melted, in two 30-second increments, stirring between. Add sugar and salt, and stir until well combined. 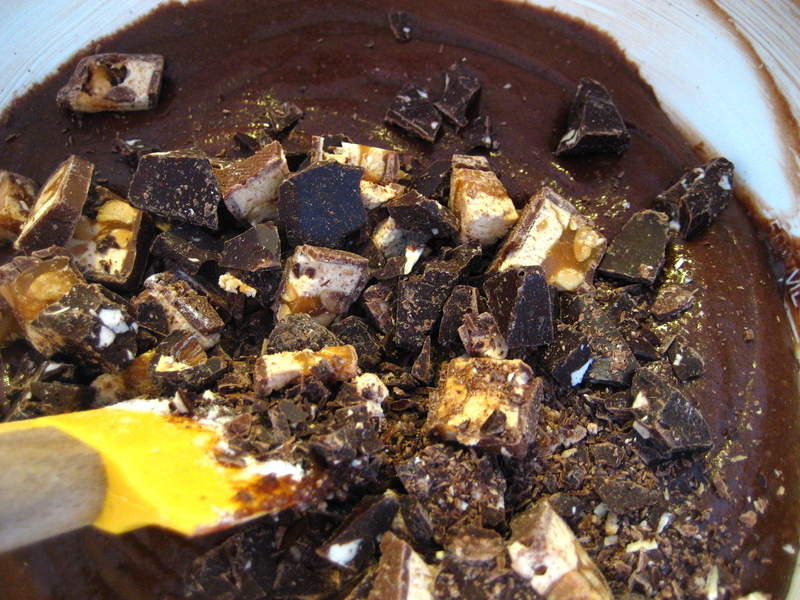 Next add the cocoa powder and stir until mixture is smooth. 3. Stir in the vanilla. Add the eggs one at a time, stirring vigorously after each one. When the batter looks thick, shiny, and well blended, add the flour and stir until you cannot see it any longer, then beat vigorously for 20 seconds with a wooden spoon or a rubber spatula. Stir in the chopped candy. Spread evenly in the lined pan. 4. Bake until a toothpick inserted into the center emerges slightly moist with batter, about 25 minutes. Let cool completely on a rack. 5. Lift up the ends of the parchment or foil liner, and transfer the brownies to a cutting board. Cut into 16 or 25 squares. This entry was posted in Recipes and tagged baking, brownies, candy, chocolate, dessert. Bookmark the permalink. what a fun idea. I love snickers and would totally add them to brownies! What a great idea!! I’ll have to try this sometime. Fun idea, I think they’d be good with Milky Ways! Sunday afternoons are definite cooking and baking time for me while football is on. I seriously want to make the Toblerone version of these. I made brownies where you put half the batter in the pan and then cover it with those Ghirardelli caramel squares, and then top the squares with the rest of the batter… and I discovered the same thing… unlike most brownies, brownies with candy inside are much better when they cool. Oooh! That caramel version sounds delicious! Caramel is definitely my favorite addition to brownies. So funny though, no matter how many times I try brownies hours later and find that they taste better cooled, I continue to eat them warm. Silly impatience. Snickers sound delicious….but I have a few others to consider. Just throwing them out there. If you want to try out these combos I’d be more than willing to taste test for you. oooh! Kit Kat would be great! I bet Crunch bar would be good too. I love crispy rice. If you try any variation, definitely blog about it or let me know.